A super supplement specially formulated for children delivering multiple benefits in one easy sachet. Unflavoured and soluble, simply add to food or drink. 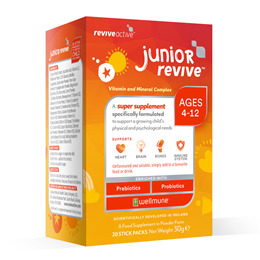 Support your child`s health with Junior Revive, a food supplement that can be added to their favourite drink or healthy cereal. Making sure your developing child gets all the vitamins and nutrients they need each day can be tough. 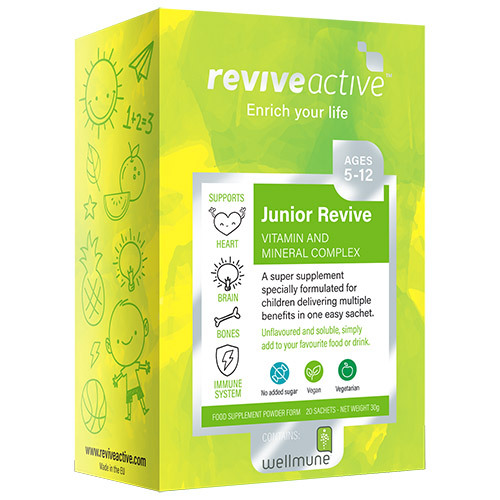 With Junior Revive, a new formulation that supports the immune system, heart, brain and bones, parents can ensure their children have all they need. The easy to use daily supplement is unflavoured so it can be added to any food or drink. It includes 18 essential minerals and vitamins, Wellmune®, probiotics and 5 fruit and vegetable powders. Chicory Root Extract, Ascorbic Acid (Vitamin C), Wellmune Beta 1,3/1,6 Glucans, Apple Juice Powder, Pear Juice Powder, Pineapple Juice Powder, Magnesium Glycinate, Bacillus Coagulans, Carrot Powder, L-Choline Bitartrate, Menaquinone-7 (Vitamin K2), Zinc Gluconate, Nicotinamide (Vitamin B3), D-Alpha-Tocopheryl Acetate (Vitamin E), Selenium Enriched Yeast, Manganse Citrate, Calcium Pantothenate (Vitamin B5), Retinol Acetate (Vitamin A), Cholecalciferol (Vitamin D3) (Vegan), Pyridoxine HCL (Vitamin B6), Thaimine HCL (Vitamin B1), Carbonyl Iron Powder, Copper Gluconate, Methylcobalamin (Vitamin B12), Calcium L Methylfolate (Folic Acid), D-Biotin (Vitamin B7). One sachet per day. Mix contents of sachet with approx. 100ml of water or your favourite juice and stir to dissolve. Alternatively, add to your favourite yogurt or healthy cereal. Can be taken every day of the week, however for children aged 5-12 years 5 days a week is sufficient. Best taken in the morning with or after food. Store in a cool, dry place, away from direct sunlight and heat. As with any nutritional supplement please consult your doctor before use, especially if the person has a prior medical condition or is taking medication. Manufactured in an environment that handles milk, soya, cereals containing gluten, fish and sulphites. Below are reviews of Revive Active Junior Revive - Vitamin & Mineral Complex - 20 Sachets by bodykind customers. If you have tried this product we'd love to hear what you think so please leave a review.